A local volunteer choir meets twice a month to practice together and sings when asked at the bedside of those at the threshold of life. The Grand Rapids Threshold Choir is a local chapter of an international network of a cappella choirs whose singers serve to bring ease and comfort to those at the thresholds of living and dying. The Grand Rapids choir was started by Linda Jones in the fall of 2014. She had previously sang with the Ann Arbor chapter for three years, eventually helping to co-lead the choir. When Jones moved to Grand Rapids she notified the national directors and they connected her with locals who wanted to participate. Their first rehearsal was at a local house. "Now we've got about 15 people interested and our rehearsals are seven to 10 people. We're still looking for and welcome to new members." says Jones. "Singing at the bedside is the most spiritually engaging thing I do," she says. Jones had retired from teaching, had time and had known about Threshold Choirs from a friend who'd suggest Threshold Choir for personal healing during a bout with breast cancer. "I knew deeply it was the next right thing for me to be doing next. [I love] being able to offer something so deeply nourishing at the end of life. Music has always been my way in to the spirit." The Grand Rapids choir is currently working with Great Lakes Caring. "They will call us when someone is actively dying, when they are going to pass in the next 24 hours. The music is all a capella and very simple. There are only three people, always a small group to not overwhelm the person in the bed. The songs are short, simple songs, repeated. Repetition helps the person relax, be more peaceful. There's a national repertoire we sing from and I've written a few songs. They are full of words like, 'You're not alone,' 'cacoon of caring,' and 'You're safe, you're loved,'" explains Jones. "We are inclusive of all faiths and no faith," she says. Jones explains the Threshold Choirs are spiritual, but not specific to any one religion. Threshold Choirs are mostly women, though there are a few men. "I'm most excited about our group here because there's several young women involved, and not just old retired ladies," laughs Jones. "And one man, so that's fun." 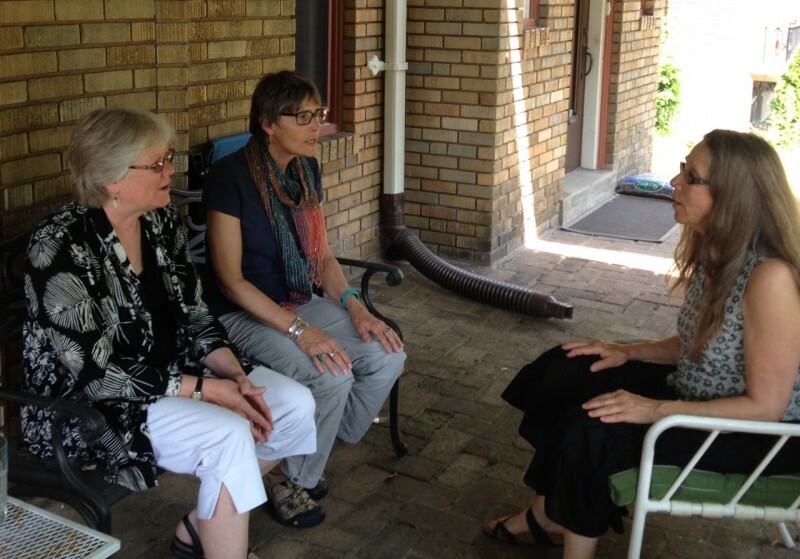 People travel from St Joseph and Holland to be a part of the Grand Rapids Threshold Choir. A choir has started in Kalamazoo because so many were coming up to Grand Rapids. "The music connects us," says Jones. Besides supporting those on the threshold of life and death, Jones says that members in Threshold Choirs are very supportive of one another and says it has become a very nourishing community. Choir members travel to support one another when family members are dying. Threshold Choirs were started by Kate Munger in northern California. "This is a choir for people who want to serve, who can sing independently and have spent some time thinking about their own mortality. It's very easy to get overwhelmed at someone's deathbed if you haven't made some sort of peace with your own mortality," explains Jones. The Grand Rapids choir is welcoming new members over the summer. "We're always open to come at the invitation of anyone. We're also open to sing at other major thresholds like major surgery, pre and post childbirth or divorce. It's about supporting people," she says. "Eventually I'd like to have the choir sing once in a while in public so that anyone in the public could come and find community and support." The Grand Rapids Threshold Choir practices on the second and fourth Fridays of every month from 7-9 p.m. Contact Linda Jones for further information and location.